Forgive me for being horribly cliche, but it is well and truly winter here in Sydney. As I sit to write this post it has been cold and pouring rain all weekend - but I ain't complaining, helloooo to staying in bed with a cup of tea and watching TV all day! Winter is definitely one of my favourite seasons. I love nothing better than snuggling under mountains of blankets, thick coats and woolly scarves - and of course rocking a good ole berry lip. My skin on the other hand, a completely different story. My skin in winter is notorious for becoming a dry scaly mess, so just like I switch up my wardrobe, I must do the same with my skincare routine. 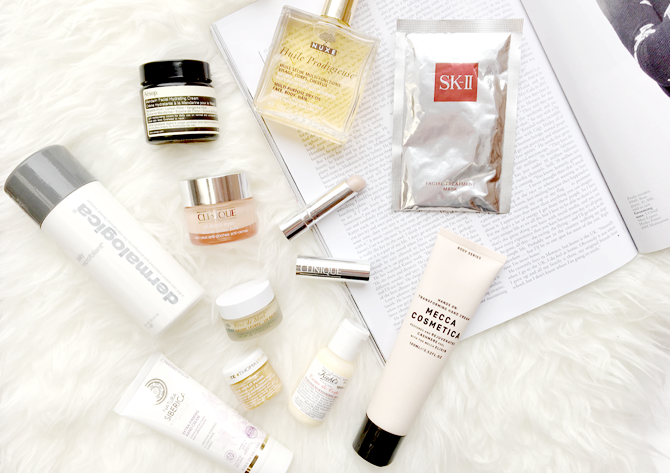 As my skin is oily at the best of times, adding extra hydration can be tricky tricky business. These are the skincare products that I have been currently using to help me get through the next 3 months ahead. Hands up if you are guilty of spending an extra 5-10 minutes longer in a hot steamy shower as the mornings get cooler and cooler? Yeeeeeeepppp me too *hangs head in shame*, and my skin is not thanking me for it at all. Since I attended the Bloggers United AU event last week in Brisbane, I have been slathering this Kiehl's Creme de Corps* sample all over my body and I can definitely see a massive difference in my dry skin. Creme de Corps is an all over body moisturiser made with coca butter and beta carotene that claims to be perfect for dry and flaking skin, and I can definitely attest to that. I have horrible dry patches all on my upper arms and chest that worsens in winter and sadly I have never really found anything that helps - until this. My skin is left feeling moisturised and smooth, but best of all not itchy. When this sample runs out I will be buying the full size for sure. For an extra dose of moisture for my body, I like to use the Nuxe Huile Prodigieuse Multi-purpose Dry Oil before bed. I use this all over my body but particularly on my arms (aka dry patches). This has such a beautiful scent and feels amazing on the skin making it a very much welcome addition to my evening routine. The fact that it is also a spray is incredibly handy as it insures things don't get messy and I don't waste too much. I have never tried this on my face or hair so if anyone has I would love to hear how it has worked out for you! On my face, I find that I usually get extremely dry around my eyes, my nose and around my mouth and chin - completely random places, I know. All year round I use an eye cream but I was recently introduced to the Clinique All about Eyes* a couple of months back thanks to the lovely Kristen at ActiveSkin, and honestly it is one of the best eye creams I have used to keep my eye area hydrated. As it gets cooler, the skin around my brow bone and near under eye circles can become really dry and flakey (it is just as pretty as you think...) and thanks to this eye cream I have yet to see any flakiness or feel any tightness around my eyes. It also helps to diminish puffy eyes and dark circles. I mentioned this in my Current PM skincare Routine blog post, so it is safe to say that this eye cream is now a staple for me and I will be repurchasing one as soon as I am done (though a little goes a long long way). Another Clinque goodie that has been helping with my winter woes is the Clinique Repairwear Intensive Lip Treatment*. Okay guys, if you experience chapped dry lips you need this lip treatment in your life pronto. The combination of my love for matte lipsticks and winter air have been doing a serious number on my lips, leaving them dry, flakey and everything you do not want your lips to be. However thanks to this balm my lips are plump, smooth, hydrated and most importantly flake free. This is essentially an incredibly heavy duty lip balm in a twist up tube. It only needs one swipe around lips and it is good to go. I love this as it is easy to take with me in my hand bag and use throughout the day unlike the Nuxe Reve de Miel Lip Balm, which comes in a pot and I use at night time instead. As I've mentioned many many many times, my skin is both oily and blemish prone, and sadly winter only accentuates these two problems. Throughout the cooler months, I follow the same morning and evening skincare routines but add small adjustments to give my skin a boost of extra hydration, as well as exfoliation. In winter, I particularly like to use the Dermalogica Daily Microfoliant* in the mornings. This is an incredibly gentle powder exfoliant that works to remove any dry or flakey skin that could clog up my pores. The result is smoother, brighter, refined skin. In the evenings, I use a facial oil but in winter I also like to add in a thick hydrating night cream. My weapon of choice for many years has been the Aesop Mandarin Facial Hydrating Cream. It is the only thick face cream that I have found that doesn't cause me to breakout, plus it is incredibly hydrating (as the name suggests) and smells deliciously citrus-y. And last but not least is the humble hand cream. I could quite literally be called a hand cream whore (lol) I have that many littered all over the place - plus, it doesn't help that my work place has about 50+ different types for me to play with! But my two of choice are the Natura Siberica Extra-Firming Hand Cream and Mecca Cosmetica Hands On Transforming Hand Cream. Those of you in the know, would know that Natura Siberica is one of the brands that the company I work for distributes BUT that doesn't at all alter my opinions of the hand cream. The Extra Firming hand cream has such a lovely scent (it is kinda both citrusy and herbaly at the same time) but sinks into the skin fairly quickly leaving hands hydrated and smooth. My only gripe with this cream is that the scent lingers just a bit too long for my liking so I usually reserve it for night time and the Mecca one for day. That rounds up my skincare winter survival kit, lookout for a make-up version appearing soon! What products help you survive the cooler months? I love Clinique all about eyes. It feels very gel like and it's such a good moisturizer! Lovely photo! I really love the sound of the Kiehls Creme de Corps, I think I actually have a sample somewhere, I'll have to give it a go! You've got some beautiful products there! I would love to try aesop products, they sound far too dreamy! I'm the exact same, I love winter for the cosiness of it all but my skin hates it, especially my hands! I'm currently using the Korres hand cream but I think I got that Mecca one as a birthday gift this year so I should probably open it and give it a go! I love the Nuxe Multi-purpose Dry Oil and I'm a fan of the Clinique All about Eyes. Need to try some of the rest you have there because they sound lovely!